The best way to follow up on a job application. The interview went well. You are feeling confident and excited. This job is yours! But, a week has gone by and you havnt heard from anyone. What do you do? Do you email, call? Is it too soon? Will they be irritated by you? Will they be happy that you followed up? It is always a difficult time – that period between interview and the call that will tell you that you succeeded or you failed. 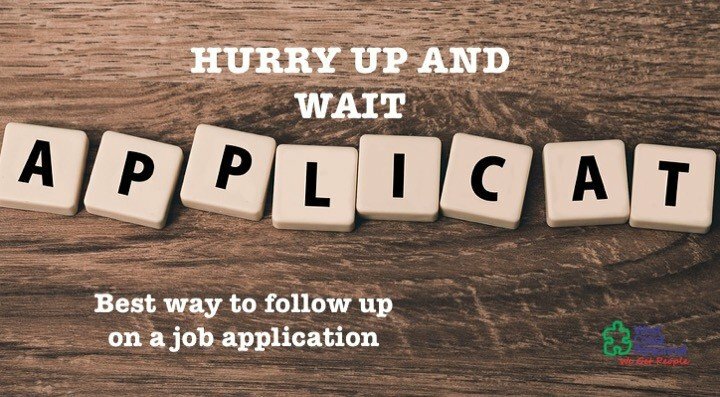 So, what is the proper protocol when following up on a job application? And, should you follow up at all? The consensus is that, yes, you most definitely should follow up. Its in the when and how that makes all the difference. As for when, it appears, according to a study with various HR Managers, that the best time to follow up is around 1,5 to 2 weeks after the interview. Ok, cool, so its been almost 2 weeks, now what is the best way to follow up? Check with anyone you know inside the company as to what the talk has been. This will give you a better understanding of how to approach the powers that be. If at all possible, get the decision makers details. That may be the HR Manager, the recruitment agency head, or the boss himself. They will be the best people to advise you on the job application. So, no response after another week after your email on the job application, what now? Now, you call. Ask to speak to the person you emailed and if its a good time. If not, phone back when it is. Asking them to call you back can lead to you not taking the call, missing the call for whatever reason, and that will just frustrate the caller. You call back. Once you have them on the line, pretty much follow a similar format to your email. Ask whether they received the email first, then let them tell you like it is. If they say there are still busy and to follow up in another week, well, then do that. And, ask whether you must email or call. Whether you get this job or not, you have followed a polite and non-invasive process. While you may not have succeeded here, keep pushing on and keep following up in this same way.